You don’t need to buy pricey apple dips for your next party or to serve as a snack to your kids. You can easily make a tasty, healthy, probiotic treat with ingredients you probably have on hand! If you have a peanut allergy to work around, try substituting almond or another kind of nut or seed butter instead. This Creamy Peanut Butter Apple Dip is so easy, there’s no reason you need to ever buy expensive premade dips loaded with sugars, and who knows what else, again! 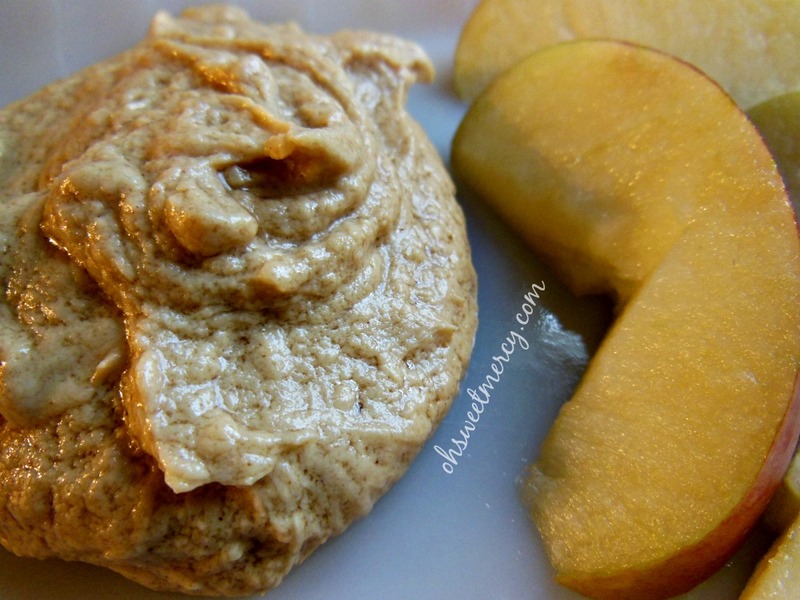 In a pinch for a lunchtime “dessert” the other day, I whipped up this super easy and healthy creamy peanut butter apple dip for the kiddos. This is another one of those things I hate to even call a recipe, because you can just dump the ingredients together until you get the consistency you like, no measuring needed! But, since I’m trying to do a better job of paying attention to measurements, I measured. I used Greek Gods Honey Kefir for this, I love this stuff! I’ve made all kinds of fruit salad dressings with it, and it’s great on top of oatmeal. Ideally, I would have my own raw milk kefir brewing on my counter but I’ve found that it’s just a bit strong for my family’s tastes. It’s really good for ranch salad dressing though, just replace buttermilk with plain kefir. Ideally, I would also use my own homemade peanut (or other nut) butter, but since I’m not “there” yet on that, I look for peanut butter that contains no hydrogenated oils. I’ve found this brand (in photo below) at Aldi’s reasonably priced, but it only comes in creamy. 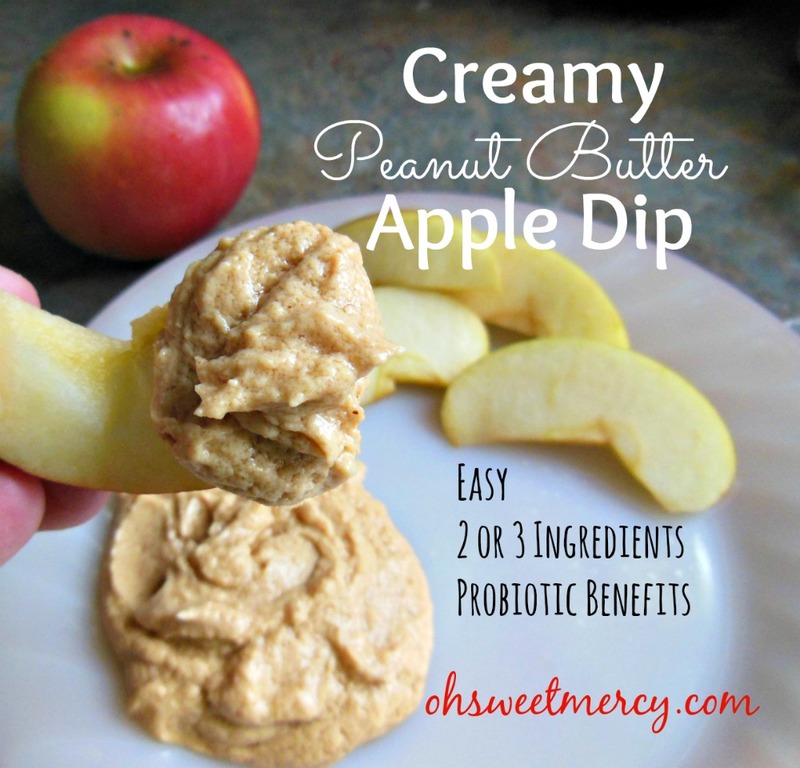 Creamy is best for this Creamy Peanut Butter Apple Dip, of course, but for other applications, I’m a crunchy peanut butter gal. Since I’m talking ideal here, I can say that I at least have some awesome raw, local honey. That is definitely ideal! Only, with the Greek Gods Honey Kefir, it is sweet enough without adding more. If you don’t have kefir, you can use vanilla or plain yogurt. With the plain yogurt, you’d definitely need to add honey (or other natural sweetener). This is delicious with sliced apples, and I’m going to try it with celery sticks too. The kids loved it, and I love that they’re getting some healthy probiotics without even knowing it! And honestly, it’s just good enough to eat right out of the bowl. With your finger, if necessary. But I’m just speculating there, really. Ahem. 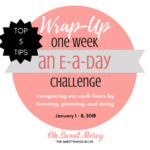 Super easy and tasty way to get probiotics into your family! 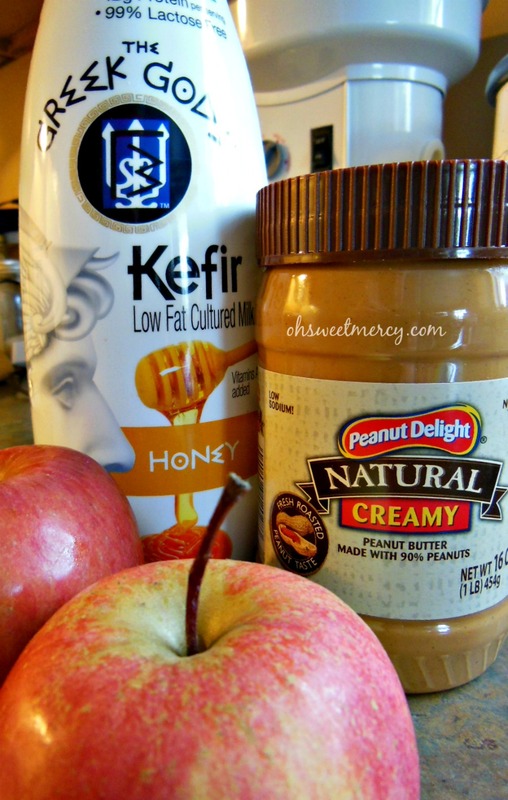 Essentially, just mix equal parts of peanut butter and kefir/yogurt together and add more honey to taste. I used Greek Gods Honey Kefir and it was plenty sweet for our taste. If you use plain yogurt you'll certainly need to add honey or maple syrup or whatever sweetening type you prefer. Serve with sliced apples or even celery.